One skillet? Check. A handful of ingredients? Check. Dinner ready in under an hour? Check! 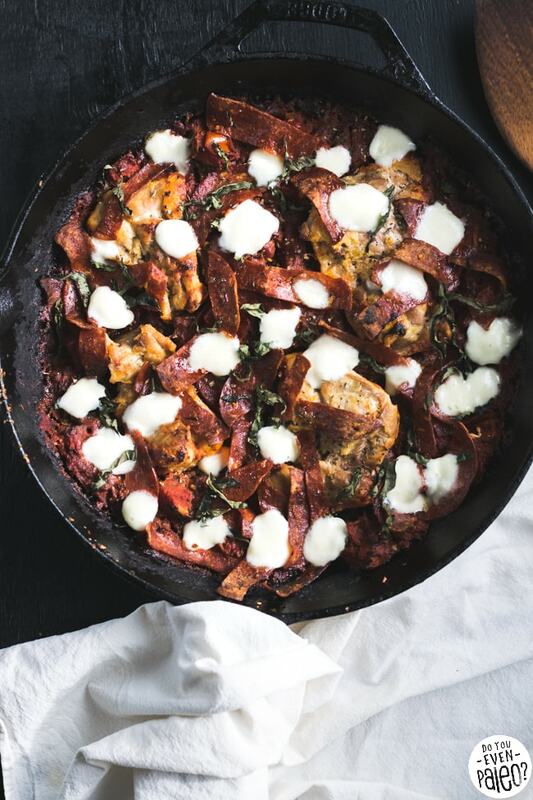 Skillet Pizza Chicken is going to become your new weeknight favorite. I’m always on the hunt for recipes that knock it out of the park. They’ve got to be fairly simple. They’ve got to please a crowd. And they’ve got to have great flavor that leaves me dreaming about what I ate for dinner last night. 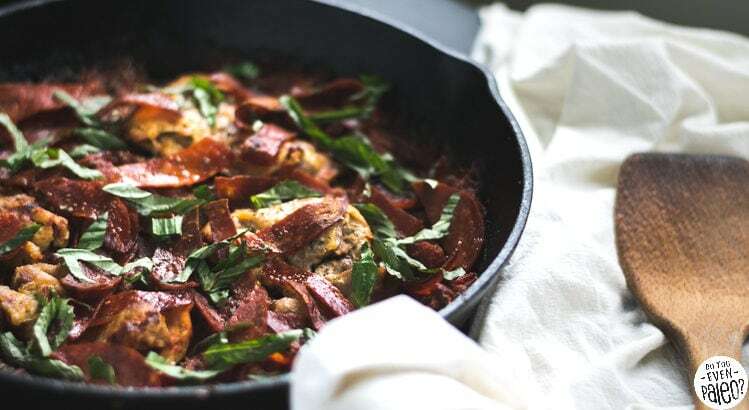 Luckily, this single skillet chicken dish is all of the above. 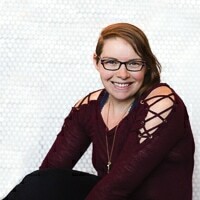 Typically, I’m not a huge fan of taking a classic food and jamming it into something else. Hamburger soup, pizza burgers, taco pasta…PASS. A few exceptions are lurking out there, though. Taco pizza is one of them. So when I saw Food52’s recipe for pizza chicken, I decided to give it a go. The results weren’t half bad, so I made some tweaks to fit my vision for the dish, and—KAPOW! I hit it out of the park. It was fan-freaking-tastic, both the first night and for leftovers the next day. It’s no secret that I’m a fan of pizza. 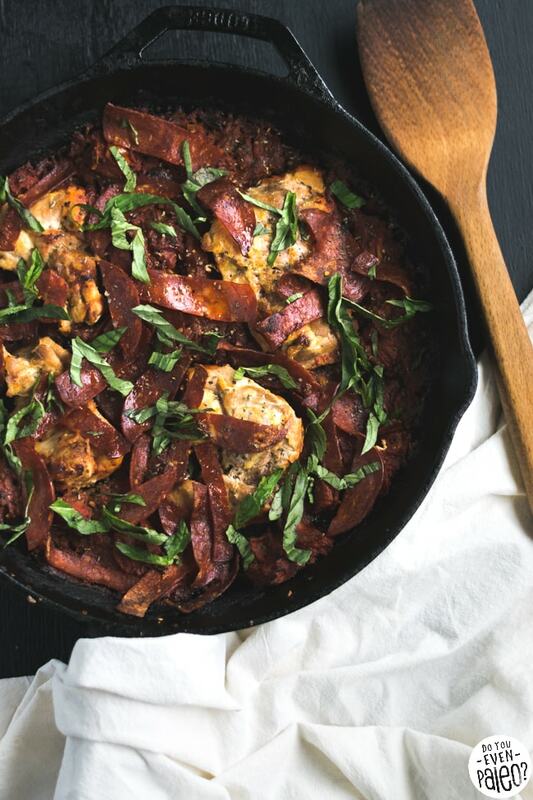 Skillet pizza chicken just seems to fit with my priorities. The best part, of course, is that making this dish means you can entirely skip the crust part! Okay, I’ll be the first to admit I like a good pizza crust, but making it at home? I’ll pass. It’s so indecently difficult to make a good gluten free pizza crust at home. And I mean…not just passably good, but damn good. I’m a food blogger, so you’d think I’d be up to the challenge. Well, sometimes. But for the most part, I like simple recipes that still pack a ton of flavor. So a recipe like this, where I don’t even have to worry about baking up a perfect crust? Yes please. 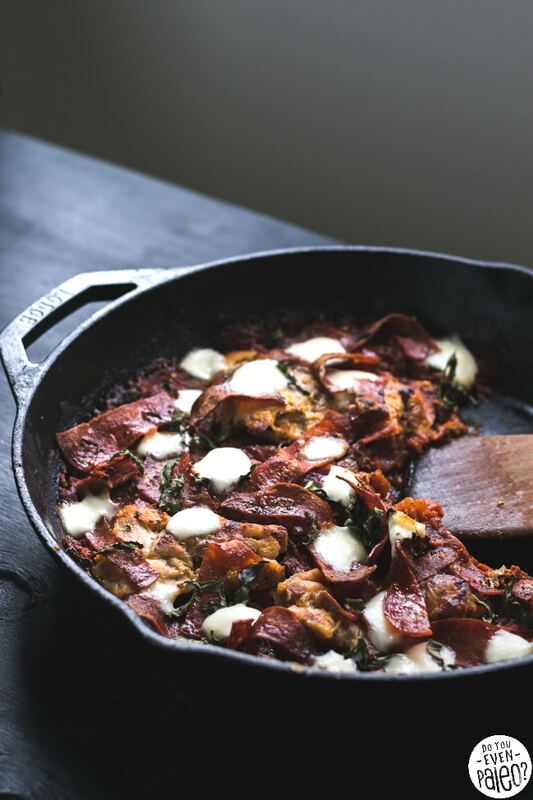 Of course, to keep this meal paleo or dairy free, you would omit the mozzarella. It’s perfectly delicious without it. But if you can handle the dairy, why not add these soft, puffy little globs of heaven? If you’re going to use mozzarella, I highly recommend using a fresh ball of mozzarella. No block or shredded cheese here. The texture is totally different when you opt for fresh cheese. And after the cheese melts and you pull the chicken out, you get those stunning long strands of melty cheese that are a pizzeria advertisement staple. So go with fresh mozzarella! Add in your favorite pizza toppings (preferably veggies). Black olives and mushrooms would be on my list! If you can’t find paleo/Whole30 pepperoni and you need to stick to that for whatever reason, sub in prosciutto. Heat a large cast iron skillet over medium-high heat. Add the pepperoni to the skillet and cook for about 5 minutes, stirring occasionally, to crisp up the pepperoni. Remove from the skillet and set aside. Add the olive oil to the skillet and cook the chicken thighs for 10 minutes, flipping once, until lightly browned but not cooked through. Transfer to the same plate as the pepperoni. 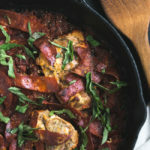 Add the garlic and chili flakes to the skillet. Cook for 1 minute, stirring frequently. Pour in the diced tomatoes and stir in the oregano and basil. Cook for 10 minutes, stirring occasionally, while the sauce thickens. 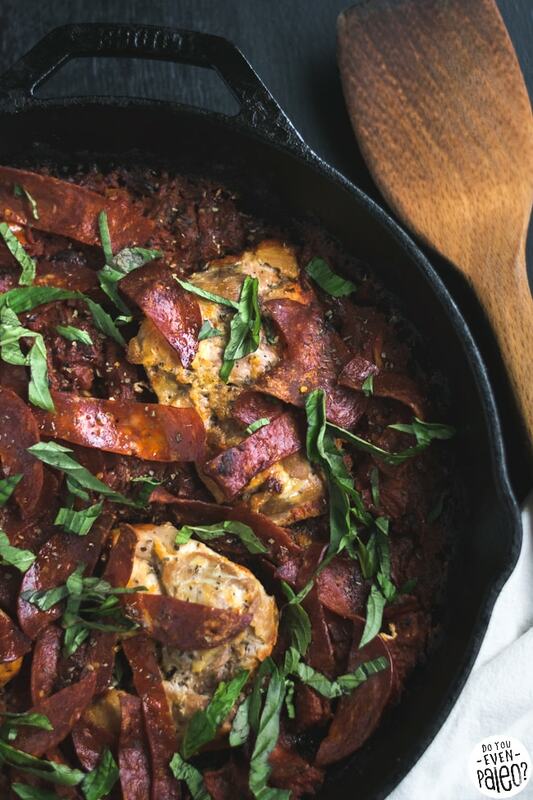 Return the pepperoni and chicken thighs to the skillet. Transfer to the oven and bake for 20 minutes, until the chicken is cooked through. Remove the skillet from the oven. If you’re adding mozzarella, turn the broiler on high. Tear the mozzarella into chunks. Sprinkle mozzarella over the skillet, and return to the oven for about 2 minutes. Watch closely! You only want it to be in long enough for the mozzarella to bubble and brown. That’s it! 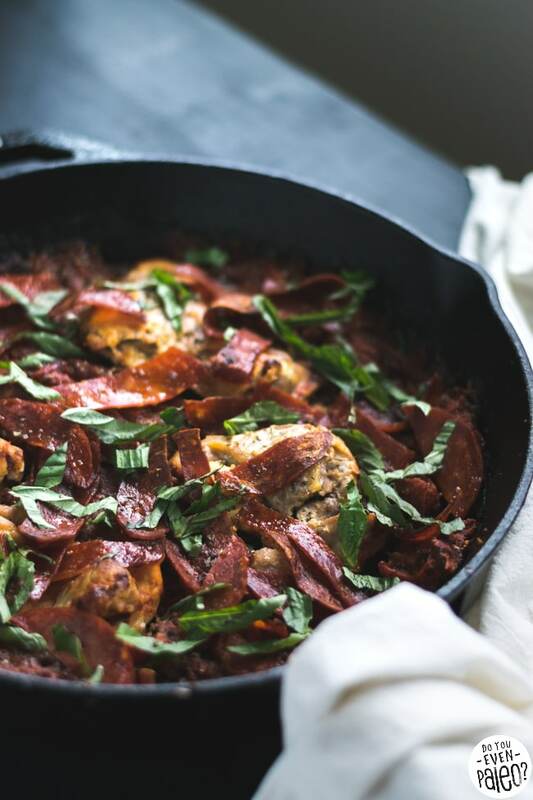 Sprinkle fresh basil over the skillet, if desired. Serve immediately. What do you think the carbs on this would be? It doesn’t seem like it has much, if any. The carb content would be pretty low! The pepperoni would likely be the biggest culprit. Well, it’s not QUITE pizza. More like pizza-flavored chicken. 😉 Not a one-to-one replacement, but still pretty dang good. Thanks for stopping by! Don't subscribe All Replies to my comments Notify me of followup comments via e-mail. 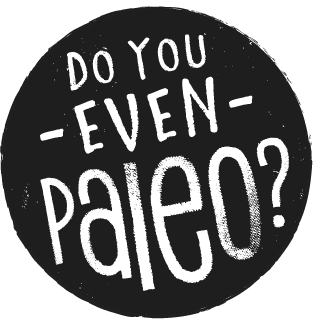 You can also <a href='https://www.doyouevenpaleo.net/comment-subscriptions/?srp=3040&srk=87505361eee98908ddf6ccb8681f50d6&sra=s&srsrc=f'>subscribe</a> without commenting.